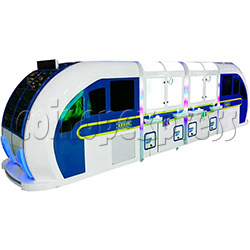 High-Speed Train Happy Travel Crane Games Machine is a cartoon High-Speed Train design 8 players crane machine, left side and right side distributed 4 control consoles. Crane Machine is with a large spaces can be arranged in different kinds of toys which within for small claws 3-5 inch and the claws 6-7 inch and the cabinet with the bright lights to make the machine eye-catching. The game play simple and easy, control the claw direction by the joystick, decline in the claw by the push button, suitable for the players of all ages. - insert coins to start the game. - move the claw left, right, front and back by the joystick to aim the prize. - press the push button to decline the claw and grasp the prize within the game time. - if grasp the prize, player take the it from the prize exit of game machine.